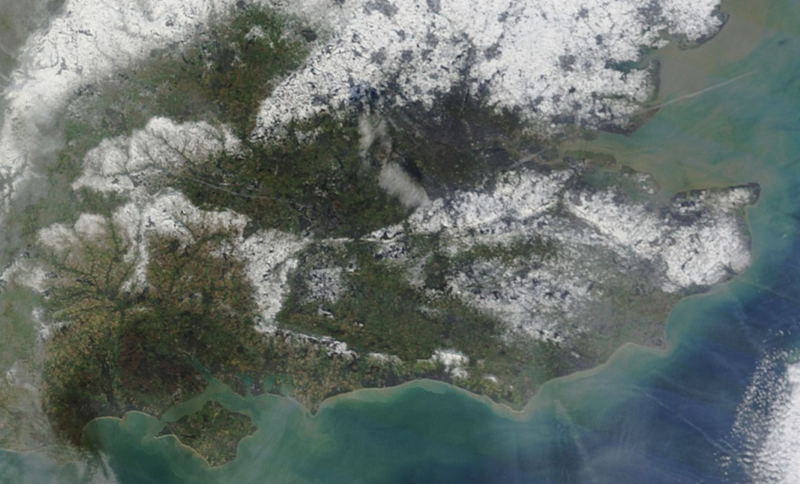 Snow cover picks out the high ground over South East England prior to the big thaw on 25 January 2013. Note the snowy North Downs and a thin thread of snow along the crest of the South Downs, in contrast to the lack of snow in the London Basin and the Thames Valley. Contrails radiating from London airports are also visible. Note the lack of snow near coasts, showing how the sea retains sufficient heat even in January to turn snow to rain or melt it. The English Channel sea surface temperature off Brighton is still over 8°C. Thank you for your message… much appreciated!